Cape Report: Article from 1994 - "Silk Tie Revolutionaries"
For decades the CFR's agenda on South Africa has been outlined in its journal, Foreign Affairs, and has been put into effect by such CFR operatives as Henry Kissinger, Cyrus Vance, George Shultz, and Warren Christopher. These agents, along with their colleagues in the media and their counterparts in Europe, were able to orchestrate an incredible international pincer attack, combining political blackmail, economic extortion, and public opinion pressure to paint South Africa as the most execrable nation on earth. Their high-level pressure helped force the South African government to make one deadly concession after another to the communist enemies of all Africans, whether black, white, Indian, or colored. At the same time, communist, Marxist, and other "Third World" regimes were (and still are) slaughtering their peoples by the hundreds of thousands and oppressing millions in the most unspeakable manner, with little international public outcry, diplomatic repercussions, or economic sanctions whatsoever. • On September 8, 1985, President Reagan signed Executive Order 12532, which declared: "I, Ronald Reagan, President of the United States, find that the policies and actions of the Government of South Africa constitute an unusual and extraordinary threat to the foreign policy and economy of the United States and hereby declare a national emergency to deal with the threat." Thus, South Africa was officially deemed to be a greater "threat" than the Soviet Union or China. • In 1986 a comprehensive study by Rand Afrikaans University's Institute for American Studies provided details concerning the funneling of hundreds of millions of U.S. tax dollars by the Reagan State Department into the coffers of radical, pro-Soviet, pro-ANC groups in South Africa. Some $200 to $300 million were channeled through the U.S. Agency for International Development, the U.S. Information Agency, the National Endowment for Democracy, the International Committee of the Red Cross, and other agencies. • Also in 1986, Assistant Secretary of State Chester Crocker (CFR) described the ANC as "freedom fighters," marking an official about-face from State's previous designation of the ANC as a terrorist group. Crocker, author of the Reagan Administration's disastrous South Africa policy of "constructive engagement," first outlined the CFR game plan in a 1980 article for Foreign Affairsentitled "South Africa: Strategy for Change." • On February 5, 1987, M. Peter McPherson (CFR), director of the U.S. Agency for International Development, announced a Reagan Administration pledge of $93 million in new aid to Botswana, Angola, Mozambique, Tanzania, Lesotho, Swaziland, and Zimbabwe. 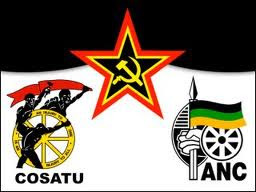 These Marxist "front line" states were involved in deadly guerilla warfare against South Africa and provided sites for Soviet-backed terrorist training camps. In 1985 Oppenheimer sent Anglo American chairman Gavin Reilly and other business leaders to Zambia for a meeting with Oliver Tambo and other senior ANC officials. This provided an enormous boost to the ANC's prestige and credibility. Oppenheimer's controlling interest in Argus Newspapers, South Africa's largest newspaper group, has enabled him to shower the ANC/SACP with an incredible propaganda windfall. His Oppenheimer Fund annually pours millions of dollars into radical causes. According to South African journalist Aida Parker, Oppenheimer's conduits have poured 320 to 350 million rand into the ANC since 1985 and have given the PAC more than 50,000 rand in the weeks leading up to the election. • In November 1993, de Klerk's National Party and the ANC agreed to the merger of the ANC's military arm, the terrorist Umkhontowe Sizwe (MK), with the South African Defense Force (SADF) into a new National Peacekeeping Force (NPKF). The results have been frightening. As Ray Kennedy reported in The European for April 22-28, the ANC's members at the NPKF training camp near Bloemfontein "distinguished themselves with nights of drunken rampaging when they hurled abuse and threats at white instructors from the South African army and broke out of the barracks. And in its attempt to quell a firefight between ANC supporters and Zulu hostel-dwellers this week, wild shooting ensued, in the course of which a press photographer was killed." • The NP/ANC Goldstone Commission was a predictably one-sided affair. Judge Goldstone was the only judge acceptable to the ANC — because of his pro-ANC leanings. Goldstone demonstrated his ANC bias earlier this year when he issued a report to the ANC before issuing it to the government. The Commission's charges that the SADF was arming Inkatha death squads was reported as 'fact' around the world.